Rob Page has revealed he spoke to his predecessor Chris Wilder ahead of becoming the new Cobblers boss. 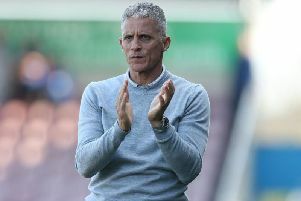 And Wilder’s glowing report on the playing squad at Sixfields only served to enhance Page’s view that he is walking into a ‘fantastic football club’ after leaving Port Vale to take his place in the Cobblers hot seat. Page was unveiled on Thursday as the new manager of Northampton Town, having signed a three-year contract, and he says he is excited by the challenge ahead of him. The 41-year-old joins after spending the past 19 months as the manager of Port Vale, a job in which he steered the club from relegation trouble to mid-table safety, and he can’t wait to get cracking in his new job. Asked what attracted him to make the switch from Vale to Northampton, Page said: “It is a fantastic football club, and it has a great group of players. “I have touched base with Chris (Wilder), as we know each other from days past anyway. I have touched base with Chris (Wilder), as we know each other from days past anyway. He has given me some information, and mostly it was about how good the group was that I am inheriting. “He has given me some information, and mostly it was about how good the group was that I am inheriting. “Chrissy spoke very highly of the group, not just from an ability point of view, but also what the group has and the team spirit they have, and you need that. “It has to go hand in hand with teams that are successful and teams that win titles in the manner in which Northampton did. “You need both sides of it, you need the quality to win you games and you need to have the right characters in the changing room, which is something I am big on as well. Page looked on from afar over the past few months and marvelled at the way the Cobblers stormed to the league two title, despite all of their well-publicised off-field troubles. “What the football club have done this season, is credit to the players, credit to the management and credit to the supporters,” said Page. “Through adversity at the start of the season, with the uncertainty of what was happening off the pitch, to do what they did on the pitch has been a fantastic achievement. To take the Cobblers job, Page had to sever links with his former employers Port Vale, and he admitted that it was something of a wrench to leave Burslem, and the club that gave him his first chance in coaching. “I will always have respect for Port Vale Football Club,” said Page. “I have absolutely loved my time there, the five years I have been there, and I will always be thankful for the opportunity that Port Vale has given me to become a manager.